Roy Spencer: Can Space.com teach us anything useful about climate? Note: red lines added to original image. In a word – no. As usual the massive atmospheric pressure at the surface of Venus is ignored. I saw a Space.com article today entitled, Can Venus teach us to take climate change seriously? While Space.com writers should know quite a bit about the other planets, the article was a fount of misinformation and gross exaggeration, says Dr Roy Spencer. The obvious purpose of the article was scare us into taking increasing carbon dioxide levels seriously, following on the Fourth National Climate Assessment (NC4) report (which I’m still trying to digest). …a nearby world has an even hotter climate problem than ours, and scientists say we could learn some valuable lessons from it. That world is Venus, Earth’s “evil twin,” which was once nice enough until something went wrong and the atmosphere began trapping a little too much heat. First of all, it is extremely speculative to claim that the climate of Venus “was once nice enough“. Then to further claim, “something went wrong and the atmosphere began trapping a little too much heat.” This makes it sound like Venus was just another hospitable planet until it reached some tipping point and a runaway greenhouse effect ensued. This kind of prose might be good for science fiction, but it does a disservice to the facts. 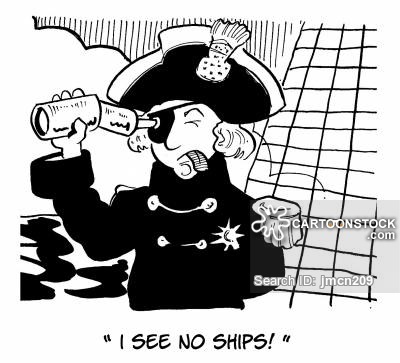 It appears they will do anything to keep the scam alive and the money rolling in from the developed nations. Since the US pulled out of the Paris money fest they have to try harder to get the money wagon rolling again by trying to shame President Trump to reverse his decision but all they are doing is showing themselves up with their fake science and/or total lack of scientific knowledge. Not even good science fiction, then. 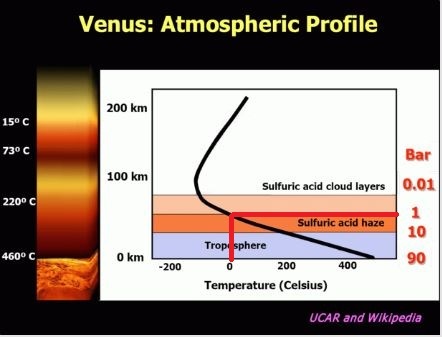 The temperature at 1 bar atmos pressure on Venus is very similar to Earth’s at 1 bar (see graphic above). The difference is that that’s the surface pressure on Earth, whereas on Venus it’s quite a long way up. That chart just supports P=density*R*T works on both planets with each planetary greenhouse in place. It just goes backwards at 1bar P(z=0 for earth) for each density(z) from the NASA forward calculation of Venus’ T(z) from its measured density(z) & known P(z). One of the issues with that chart is it computes WITH the greenhouse effect in place on both planets. That chart actually confirms there is a HUGE GHE on Venus. The difference in chart errors at each altitude is just the various weather conditions at each altitude when NASA measured the atm. density(z) from radio signals thru the Venus atm.